If this bride’s blue, hand-painted Chantel Lauren skirt doesn’t immediately make you swoon, the epic views on the coast of Vancouver Island certainly will! Mackenzie and Josiah’s wedding at Black Rock Oceanfront Resort was modern, moody, and intimate and full of unbelievably beautiful details. Mackenzie’s blue skirt, which she paired with lace tops from Kathryn Bass Bridal and Lillian Wild, wasn’t the only non-traditional element that stole our hearts. The couple’s sentimental music choices, handmade decor, and cozy s’mores by the fireside made this wedding feel wildly romantic and carefree. The true heart-stopping moments, though, came during the post-ceremony photos, during which photographer Jenna Grey and second shooter Gabe McClintock captured the newlyweds cuddled up against a stunning backdrop of black rocks and crash waves. It was important to us while planning our wedding to keep our wedding small, intimate, romantic and modern. We wanted it to feel very different from any other wedding we’d been to. It was also important to us that it was on Vancouver Island. Josiah is from Courtenay, and suggested the Tofino/Ucluelet area as an alternative to a destination wedding outside of Canada. Once I saw the coast, I was sold, so we had to get married there. And, of course, we wanted to have it expertly photographed! At the end of the day, all you have are the photos, so I wanted them to be spectacular, and reflect a dark, moody aesthetic. We tried to personalize our wedding in so many areas. For starters, my husband loves the British band The 1975, so we had several nods to the band throughout our wedding. I walked down the aisle to “Medicine” (our favourite love song by them), and we included the band’s rectangle motif that appears on all their album art in our invitations, and it was the inspiration for our rectangular arbour, which my dad built himself, for the ceremony. I was obsessed with the idea of wearing a blue wedding dress long before we got engaged — after I saw a photo of a bride in a steel blue, hand-painted Chantel Lauren skirt on Pinterest. 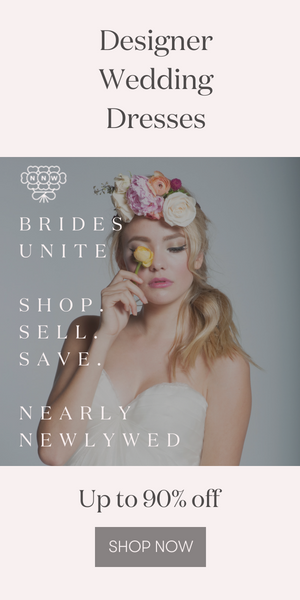 When I went shopping for my own wedding dress, I swore to keep an open mind. But, once I tried on that same Chantel Lauren skirt, there was no going back! I paired my skirt with a strapless lace top from Kathryn Bass Bridal and, for the ceremony, I added a 3/4 sleeve lace topper from Lillian Wild. My dress was non-traditional and whimsical, and I have no regrets! For both of us, the most memorable part of the day was running down the stairs together to see all our friends and family smiling, clapping, and cheering for us at our wine cellar reception. This was the first time we’d seen the room all put together and it looked amazing! All our homemade details and décor came together better than we could’ve ever imagined. We had spent so much time trying to picture how everything would go together, so it was satisfying to see our vision come to fruition. Aside from that, we felt so loved at that moment by everyone who had come to celebrate with us — it was a great feeling. Groom and Groomsmen’s Apparel – RW&Co. Congratulations and a huge thanks to Mackenzie and Josiah for sharing their gorgeous wedding at Black Rock Oceanfront Resort with Junebug! Love this moody vibe? Then you have to see this modern moody Die Woud wedding in Western Cape!